My baby will be 18 months old in a couple of weeks. He is a cute little punkin-nunkin….and I mean little! Today I was tending his cousin that is only 6 weeks older than my “turtle”. Cousin is HUGE!! He is almost 10 lbs , and a good 6 inches taller. He runs around the house chattering in a foreign language…mixed with bits of English! My baby, doesn’t crawl….he does some cool Monkey scoot. He is NOT AT ALL interested in walking. This is strange to us because all of our other babies walked by 12 months. I’m pretty sure that the reason he refuses to be a bi-ped is that we carry him everywhere. I had to, for the first year, to save him from his 2 older brothers. They love him to DEATH!! Anyway….Here is a picture of my cutie-snookums-squishy-pie (heh heh) terrorizing the pantry. He was unattended at the time because I was busy saving Mother Earth (oh brother!). The Angry Chicken posted a link to Photojojo’s photo journal tutorial. I happened to have a stack of paper, used on one side, that needed to be recycled into something great! 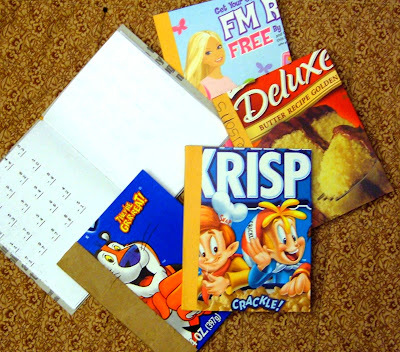 I cut the stack into fourths, and made the journal covers out of Cereal boxes that I’ve been saving. My kids were choosing which book belonged to whom before they were completed. I’m making a bunch of these to use this summer for art journals, creative writing, and mini scrapbooks. They should keep the kids busy for about 15 minutes………What will we do with the rest of the summer??? Summer options: spray bottles (forget the weenie water guns), mud, mud wrestling, mud pies, mud balls. Around here, we love mud. I’m sorry that Terror the Terrible was terrorizing yesterday! My baby didn’t walk till 17 months. He is a monster now at 20 months so be careful what you pray for!! !